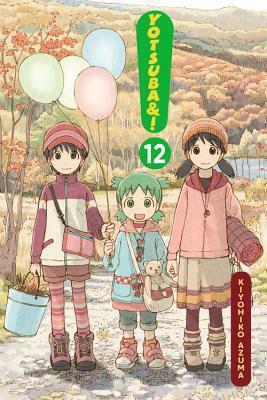 It's fall, and there's no better time to go camping in Yotsuba&! Volume 12. Note: Yotsuba&! Volume 12 is part of an ongoing series. Check out the review of Volume 1 here, and Volume 11 here. Otherwise, read on! Yotsuba is very impressed with Tora's boots. They're tall, and they tie which strings, which makes them very grown-up. Yotsuba doesn't wear shoes with strings yet, because she doesn't know how to tie them. Tora's not doing anything while she's waiting for Asagi to get home, so maybe Yotsuba can learn to tie a butterfly knot like Juralumin wears. Jumbo did an art project, and painted a table green with white socks. Doesn't it look sharp? When Yotsuba finds some paint in the house, she decides that the kitchen table should be blue. But paint is difficult, and it turns out that Yotsuba can't just wipe up her spills with a rag. Will she really be blue forever? Fall is a great time to go camping, and now it's time! Yotsuba, Daddy, Jumbo, Miura and Ena are all ready to go, when who shows up but Yanda? But even with Yanda along for the ride, Yotsuba and company can't help but have fun. Finding acorns for necklaces, cooking over a campfire and roasting marshmallows are just a few of the activities that take place during a good campout, and everything's more fun in such a beautiful location. Yotsuba&! always leaves its readers with a sense that all can be right in the world. Even when paint gets everywhere, or an unexpected person tags along on a trip, things turn out all right when people work together and have a good attitude. Lows: Perhaps laughter wasn't the best response from Daddy during the paint incident, although Yotsuba certainly learned her lesson. Verdict: Another quiet, wonderful manga from Kiyohiko Azuma.